Having a garden is one of life’s greatest pleasures. Tangible benefits can be gained from interacting directly with the natural world, including healing faster after an illness and improving kids’ creativity and learning. Just think about how the scent of an aster or the feel of its petals completely changes your mood! Flowers and other plants are beautiful and inspiring, but what I call the fourth dimension in gardening is even more so. This fourth dimension includes the insects and favorable wildlife that are attracted to your garden. Here, I will talk about butterflies, whose color and life are as beautiful as a wind-blown meadow. How can you welcome these insects into your garden year-round? First, it’s important to select plants that are native to your region. Butterflies and other insects have evolved with the bloom time and taste of plants they know best. When properly sited, native plants can be easier to maintain. Great sources for native plants can be found via the Pollinator Partnership’s regional guides and at sites likeFind Native Plants. 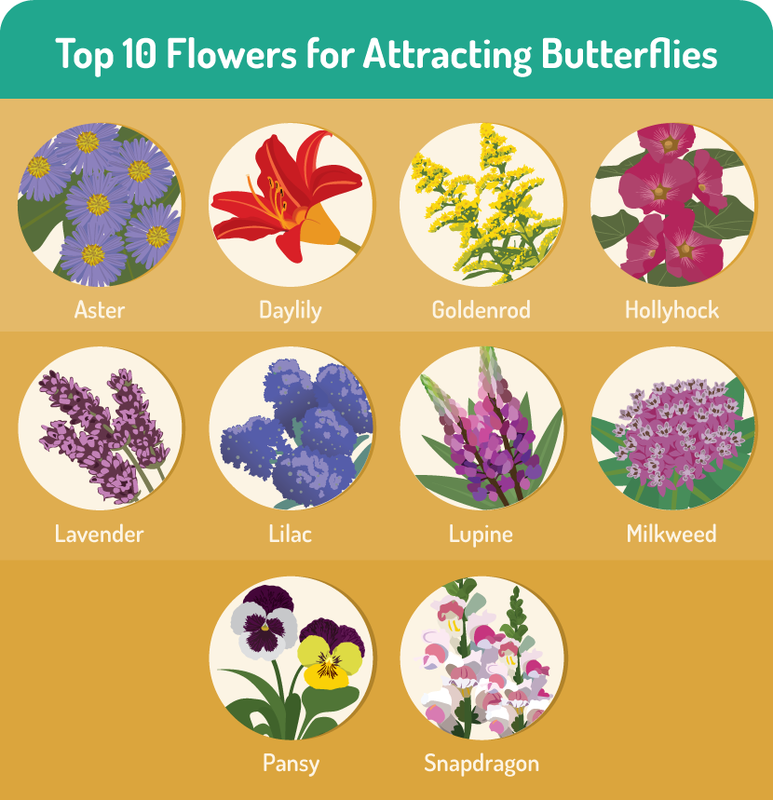 Make sure you incorporate host plants for caterpillars – zizia for black swallowtails, milkweed for monarchs, and baptisia for sulphurs. Many native grasses, such as bluestem and sideoats grama, are also host plants, as are trees such as oaks, elms, and willows. Whatever you plant, go for diversity of height, bloom size, and leaf texture – the more diverse your garden, the more life it will support from egg to wing. All butterflies are beautiful, but if your heart lies with the royals, you may wish to attract monarch butterflies above all others. In that case, you must plant milkweed. 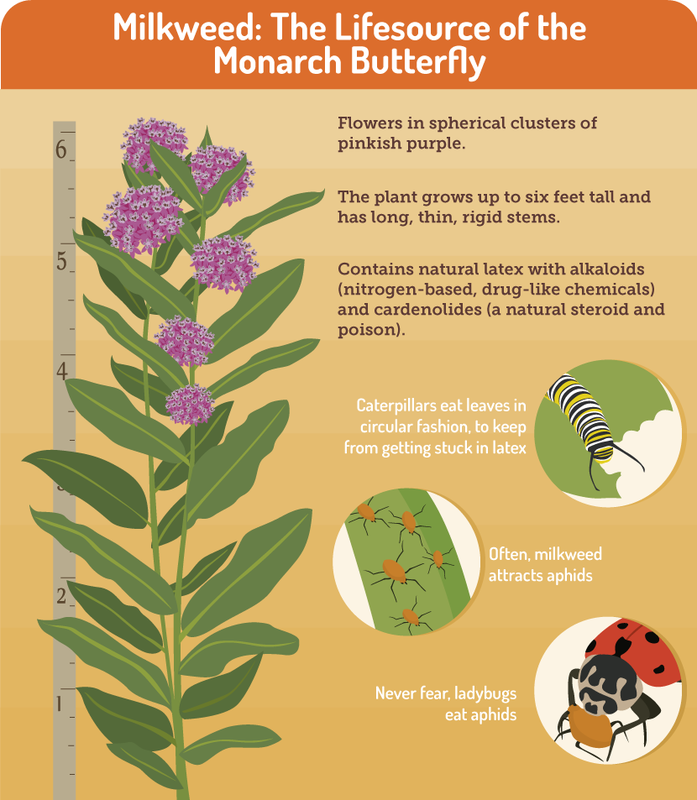 Monarchs need milkweed to survive because it hosts much of their lifecycle. Monarchs lay their eggs on the underside of the milkweed’s young leaves in the spring/summer. 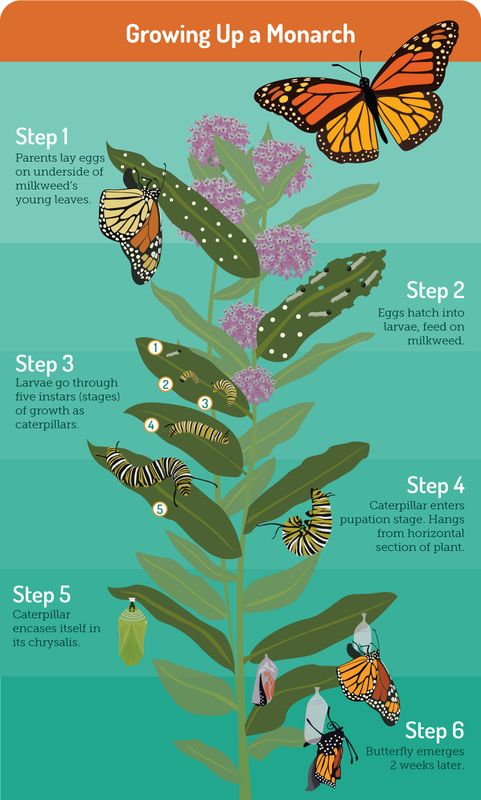 The eggs hatch into caterpillars, known as larvae, and feed on the milkweed through the five stages of their growth. During each of the five stages, known as “instars,” the insect grows larger and the appearance of its banding pattern changes. If you see a caterpillar gorging on the leaves on your milkweed, don’t bother it – wait just a few weeks and you’ll see it return with spread wings. After the fifth instar, the caterpillar enters its famous pupation stage. The insect finds a horizontal section of a plant and spins a silk pad to hang from vertically. The caterpillar then sheds its skin, revealing a chrysalis in which it encases itself. This chrysalis is like a green exoskeleton that protects the monarch while it is pupating. This process takes about two weeks to complete. If you cannot find the caterpillars that were recently feeding on your milkweed, don’t be concerned. Caterpillars will often leave their host plant to find a good place to pupate. Just wait a couple of weeks for the monarchs to appear as fluttering adults, ready to mate. After they emerge from the chrysalis, these amazing creatures remain hanging for a while to dry their wings and pump fluid into them for flight. Milkweed is a wildflower that is native to the U.S. Growing up to six feet tall, the plant has long, thin, rigid stems, with a spherical cluster of pinkish-purple flowers. The name milkweed describes the milky sap, which contains natural latex. This latex contains alkaloids (nitrogen-based, drug-like chemicals) and cardenolides (natural steroids), which in some species can be toxic. If you watch caterpillars eat milkweed, you’ll notice they eat in a circular fashion. This is thought to keep the caterpillar from getting stuck in the latex. However, the consumption of the cardenolides and alkaloids makes the monarch itself taste terrible to predators. This helps protect monarchs from becoming prey. That being said, milkweed must be handled with care. 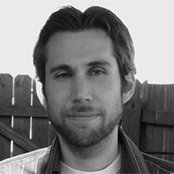 First, you should never eat milkweed – it will make you vomit. Second, you should avoid getting the sap on your skin or in your eyes. Milkweed is drought-resistant, and it grows best in well-drained soil. The leaves of the plant are broad and oblong, providing lots of food for monarchs. Often, milkweed will attract aphids. However, you don’t have to worry about them because ladybugs will often show up and eat the aphids. Don’t use chemical sprays of any kind; instead, create an organic garden. If you have a garden full of various flowers, shrubs, and trees, you will attract beneficial predatory bugs that will take care of any pests you might have. Be patient. For example, plants such as vanilla-scented swamp milkweed (Asclepias incarnata) often attract aphids, but ladybugs will come to the rescue within a few days. You should also be aware that “organic” treatments can be just as deadly to a butterfly or caterpillar as any inorganic spray. Nature is sometimes a far better manager of diversity and life than we are. Leave your garden standing for winter. Avoid the impulse to create a tidy or clean landscape. Many butterflies overwinter in leaf litter or brush piles as adults (mourning cloak), as caterpillars (viceroy), or in a chrysalis (black swallowtail). Butterflies aren’t the only insects hibernating – many moths and beneficial native bees are out there taking shelter, too. Try to wait until the last possible moment each spring to cut back your plants so you don’t disturb the gentle creatures waking in March and April. Besides, a standing winter garden is beautiful to look at; full of bright oranges, rusts, and tans. In addition, it will capture more snow to hydrate the soil and insulate plants from the cold. When you garden with butterflies in mind, you heighten your own garden experiences and you help life flourish beyond it. Many pollinators struggle with shrinking wild habitats in our chemically doused world, so your garden can be a refuge, not just for you, but for all the beneficial bugs that pollinate our crops and provide us with one of every three bites of food. Gardening for butterflies connects you to nature in spectacular ways while giving you a garden that will surprise you year-round.